One thing I really like about today’s Dreamforce keynote (apart from the length — two hours in, it’s still ongoing) is the way the product announcements hang off of customer stories. Instead of CEO Marc Benioff and his Salesforce.com colleagues headlining with the latest technology and tacking the customer stories on as an afterthought (last year it was almost embarrassing, the hall emptied as the session ended with a series of customer stories), this year the customer stories take precedence and the new product features are illustrated with use cases grounded in what customers are doing. 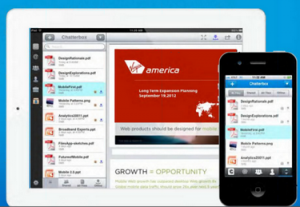 So it was with the introduction of Chatterbox, the new file syncing and sharing add-on to the Chatter collaboration stream (“a Dropbox for the enterprise,” as Salesforce is calling it), which will be available next year. The feature was demonstrated in the context of a story set at Virgin America, using the airline’s plan to add a Chatter stream to its seatback touchscreens next year. The demonstration followed the creation of a map that was uploaded to the Chatter stream to help a frequent flyer find his way off a delayed incoming flight to get to his next flight connection. It’s great to see the technology related to practical real-life examples in this way. Of course, paramount in my mind while watching this was, how will this new Chatter feature impact other file sharing companies also targeting the enterprise space? In particular Box and Huddle, both of whom I follow closely. What struck me immediately is that what Salesforce.com has done with Chatterbox looks at the requirement from a very different angle. Both Box and Huddle are explicitly aiming to replace traditional enterprise content management. Their products start from the file, and then build the collaboration around it. Chatterbox starts from a different point. The file syncing is an adjunct to the signals that are the core of Chatter, and the collaboration is not file-centric but signal-centric. That’s because Chatter is grounded in the relationships and processes that flow between people rather than the documents they share. This is probably the right way around, and is something Box, Huddle and other document-centric collaboration vendors probably need to think hard about. Something else for them to think about is a throwaway line that executive vice president of technology Parker Harris mentioned as he launched into the Chatterbox demonstration, which revolvd around a Virgin America customer experience agent named Sherman using his Chatter feed. What Harris said was: “Sherman works in the field.” That of course is the holy grail for any collaboration vendor — or indeed for any enterprise software vendor. To become the app where employees spend the majority of their working day is a massively defensible position of market power. With today’s announcements including Chatterbox, Work.com and Salesforce Identity (more thoughts to come later on those), the Salesforce platform, leveraging Chatter, is getting ever closer to that ideal position.